A comprehensive, long-format review of Peter Pilgrim's Java EE 7 book. Packt Publishing recently (September 2015) published Peter Pilgrim's Digital Java EE 7 Web Application Development with the subtitle "Develop Java enterprise applications to meet the emerging digital standards using Java EE 7." Digital Java EE 7 Web Application Development contains 9 chapters and 4 appendices spanning over 400 pages. The book's subtitle is "Develop Java enterprise applications to meet the emerging digital standards using Java EE 7." The Preface contains short summaries (2-3 sentences each) of each of the book's chapters and appendices. It also lists the software necessary to run the examples provided in the book: Java 8, GlassFish 4.1, Gradle 2.6,Chrome DevTools, Firefox Developer Tools, "Chris Pederick's Web Developer and User Agent Switcher extensions", and "a decent Java Editor or IDE for coding." In describing "who this book is for," the Preface of Digital Java EE 7 Web Application Development states, "this book is pitched at intermediate Java developers" with "a good command over the programming language" that includes Java SE knowledge of "classes, inheritance, and Java Collections" and Java EE knowledge of "Java persistence, Java servlets, and deployment of the WAR files to an application server." The initial chapter of Digital Java EE 7 Web Application Development begins with a high-level introduction to working in the digital domain and looks at how Java fits inside the digital domain. There is specific focus on recent changes in Java 8 including removal of PermGen, introduction of the G1 garbage collector and introductory code listing and explanatory text related to lambda expressions. JavaServer Faces (JSF) is the exclusive topic of Chapter 2 of Digital Java EE 7 Web Application Development. The chapter introduces JavaServer Faces with a historical perspective and references terminology such as responsive design, mobile web design, Digital by Default, and Default to Open. A brief history of JSF is outlined and some key new features of JSF 2.2 are listed. Arguments for choosing JSF over other Java-based web frameworks are also made and mostly center around JSF being a standard. The second chapter introduces Model-View-Controller (MVC) and describes how JSF implements MVC. The chapter provides a high-level overview of Facelets and looks at the JSF request processing lifecycle. The chapter provides multiple JSF code listings and demonstrates JSF features such as JSF annotations, expression language, web descriptor, and JSF XML namespaces. After providing another JSF code example, Chapter 2 returns to more in-depth coverage of expression language. Like the second chapter, Digital Java EE 7 Web Application Development's third chapter is JSF-centric, but does include some HTML5/CSS/Bootstrap code in the example that is built throughout the chapter. This chapter begins with an example of implementing a CRUD-oriented application using a JSF Facelet withBootstrap via passthrough. Several JSF tags and tag libraries are introduced as they are applied in the example being built up in Chapter 3. The example constructed in Chapter 3 also demonstrates use of Java Persistence API (JPA) as functionality to allow contacts to be created, read, updated, and deleted is added. One of the things that can be confusing to someone new to JavaServer Faces is the difference between the older JSF managed beans and the newer CDI-based beans. The third chapter concludes with a discussion that addresses this. The fourth chapter of Digital Java EE 7 Web Application Development begins with an explanation of why validation is important in web applications and then introduces and contrasts server-side validation with client-side validation. The chapter then details using the h:message and h:messages JSF tags to display errors. Chapter 4's coverage of validation in JSF introduces "two main ways of achieving validation": Java EE 7's Bean Validation 1.1 and "traditional" JSF validation. The chapter provides a code example, a table of relevant annotations, and explanatory text in its introduction of bean validation. Explanatory text and code listings are also provided in the introduction to JSF validation. This fourth chapter also introduces applying the attributes requiredMessage, validatorMessage, andconversionMessage for custom messages. The chapter looks at overriding validation messages globally via properties files and demonstrates adding a custom validation method to a rendering tag. The section of Chapter 4 on custom validators demonstrates creating a custom validator by writing a class that implements javax.faces.validator.Validator and annotating it with@javax.faces.validator.FacesValidator. The "Converters" section of Chapter 4 describes converters as "JSF classes that convert between strings and objects" and then provides detailed discussion and code examples implementing a custom converter. Chapter 4 also looks at "validating immediately with AJAX." This section introduces Ajax and JSF's "built-in support for AJAX requests and responses." It introduces <f:ajax>, provides multiple code listings demonstrating use of it, provides a table of its attributes, and looks at how it relates to the JSF lifecycle. One of Chapter 4's major sections is "Handling views" and this concluding section of the chapter covers invoking and passing parameters to controller methods, invoking an action event listener, redirecting pages, and debugging JSF with <ui:debug>. 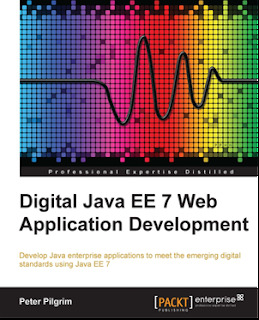 Chapter 5 of Digital Java EE 7 Web Application Development focuses on "JSF conversation scope." The chapter begins by looking at how JSF integrates Context and Dependency Injection (CDI) context and dependency injection. The chapter defines "conversational scope" as "defined by a lifecycle that spans many HTTP requests to the server." The @javax.enterprise.context.ConversationScoped annotation and the CDI-injectedjavax.enterprise.context.Conversation interface are introduced and demonstrated early in this chapter before coverage of the lifecycle of a conversation scoped bean. There are several screen snapshots and code listings in this chapter. These payday loan application examples include application of Bootstrap CSS and JSF 2.2's support for HTML5-friendly pages with new namespacehttp://xmlns.jcp.org/jsf. They illustrate applying Ajax, jQuery, and the HTML5 Range element. The final major section of the fifth chapter covers JSF custom components. An example of a custom component implemented with an XHTML-defined Facelet view backed by a backing bean is provided. Another portion of this section introduces the JSF 2.2 ability to "generate the custom tag without specifying any XML declaration." Digital Java EE 7 Web Application Development's sixth chapter emphasizes what I think may be the most interesting feature of JSF 2.2: Faces Flows. The chapter begins by explaining the use cases and sample applications that inspired and can make most use of Faces Flow before delineating some key characteristics of Faces Flow. Several early sections use code listings to demonstrate use of annotations (such as@javax.faces.flow.FlowScoped) and other Faces Flow concepts in simple flows. Chapter 6 demonstrates use of the <error-page> element to declare "an association between an exception type and a page view" that allows for nicer presentation of the "one of the most notorious exceptions" encountered in JSF-based applications (javax.faces.application.ViewExpiredException). The sixth chapter also looks at complex flows. It demonstrates and describes flows that switch on different cases (conditional) and nest flows. In addition to the inline explanatory examples, the chapter includes a "a real-world example" with significant discussion on security-related aspects. Faces Flows is not the only JSF 2.2 feature covered in Chapter 6. The chapter also introduces Resource Library Contracts. Several nuances are demonstrated with code listings and there is a section on using Resource Library Contracts in conjunction with Faces Flows. The chapter concludes with a bullet list of tips for using Faces Flows. RequireJS, Underscore, and Grunt are also introduced in Chapter 7. There are several pages devoted to each that introduce some key features and uses of each framework. The design philosophy behind building an application on a single page such that it resembles a desktop application is in marked contrast to the JavaServer Faces' original design of navigation links between pages. ... JSF lends itself to applications that are extremely stateful in nature and design, where the customer journey is based on page-to-page navigation. After successfully explaining why JSF in not a good fit for the single-page design model, the author lists some advantages and disadvantages of the single-page model. An example of a single-page application for this chapter is introduced and is related to managing case worker information. This example is defined in more detail after the AngularJS coverage. Chapter 8 introduces one of the trendiest and most popular web development frameworks in AngularJS. The introduction is fairly thorough for only being part of a single chapter. Significantly more details of AngularJS are illustrated with a return to the caseworker application implemented with AngularJS. The casework sample application demonstrates use of Java EE features such as JPA, REST-based web services with JAX-RS, and WebSocket in addition to AngularJS. The final chapter of Digital Java EE 7 Web Application Development is a future-looking chapter that looks past Java EE 7 and introduces the JSR 371: Model-View-Controller (MVC 1.0) Specification. The chapter explains why this specification is being planned for Java EE 8 and also introduces a reference implementation of it (Ozark). Because Java EE 8 (JSR 366) is still forthcoming, Pilgrim warns the reader of this chapter, "the information here is subject to change because MVC is evolving." This ninth chapter introduces the new package called javax.mvc and the @javax.mvc.Controller annotation. The chapter then explains and illustrates applying MVC 1.0 with JAX-RS annotations. The examples and explanations also cover using JSF for the view portion and using the javax.mvc.Models interface for the model portion of an MVC 1.0-based application. The final chapter concludes with a look at a couple ways in which the Java MVC 1.0 specification might still change and with a discussion of design considerations when using Java MVC. Appendix A ("JSF with HTML5, Resources, and Faces Flows") is a "quick reference" on the JSF library. The first part of this appendix is a standard library reference with emphasis on Java EE 6 (JSF 2.0) and Java EE 7 (JSF 2.2) versions of JavaServer Faces. The second part covers Faces Flows with a thorough reference. Appendix B ("From Request to Response") covers common topics associated with a web application's architecture. These topics include HTTP (protocol itself, advancements, request methods and response codes), standard Java EE web architecture (servlet + CDI + EJB), extended Java EE web architectures (NoSQL,Model-View-ViewModel, Java Temporary Caching, embedded server/containerless system, microservices), and brief discussion addressing the question, "Is it important to be known as a full stack developer?" Appendix C ("Agile Performance – Working inside Digital Teams") consists on ten pages that look at structure of agile digital development teams and roles on those teams. Appendix D ("Curated References") is over six pages of "references around the digital software development" that are categorized "into concepts and themes" of "Service delivery", "Agile and leadership", "Architecture", "User interface", and "Java EE and JVM technology." Because these references include URLs, it is easy to click on these in the electronic versions to be taken directly to the referenced resource. What is Digital Java EE 7 Web Application Development and Who Is It Best Suited For? One of the most valuable insights I believe I can provide to someone trying to decide whether to purchase or borrow this book is to articulate what this book covers and who it is best suited for. I attempt that here. Digital Java EE 7 Web Application Development provides significant coverage of JavaServer Faces (JSF). Chapters 2 through 6 are almost exclusively JSF-focused and JSF has significant presence in Chapter 1 and Chapter 9. It's not just JSF, however, and covers using HTML5 and related popular frameworks and libraries with JSF. Chapter 8 (single-page applications with AngularJS) is not JSF at all. Digital Java EE 7 Web Application Development focuses on newer JSF features. As its title implies, the focus of this book is on Java EE 7 and JSF 2.2 with some mention of Java EE 6 (JSF 2.0). This is probably NOT the book you want to get to learn JSF for the first time, but rather is more suited for someone with minimal JSF experience through JSF 2.0 who wants to learn what's available in JSF 2.2 and Java EE 7. Digital Java EE 7 Web Application Development provides broad coverage of developing Java EE 7 web application user interfaces. JavaServer Faces is the predominately covered approach, but that is not surprising given that JSF is advertised as "a server-side component framework for building Java technology–based web applications" and 10 of the 15 Java EE 7 Tutorial chapters on The Web Tier cover JSF or a portion of JSF. There is very little (almost no) coverage of Java servlets or Java SOAP/WSDL-based web services (JAX-WS). The focus is instead on JSF with significant mention of JAX-RS/REST. There is also no significant coverage of the myriad of non-standard Java/JVM web application frameworks such as Struts 2, Spring MVC, Java Spark, Grails, Play, or Google Web Toolkit. Intermediate-level (or advanced) Java developers (as described in the book's preface) who have only basic familiarity with JSF and want to learn more about newer (Java EE 7/JSF 2.2) JSF features. Java developers with only limited awareness of modern web client technologies and frameworks who want to learn how to use JSF with HTML5 and related technologies. Java developers who want a broad view of the currently favored and standard Java EE 7 technologies for web development and want an introductory chapter on Java EE MVC coming with Java EE 8. Developers looking for an introduction to JavaServer Faces; this book is better suited to developers with at least minimal JSF experience as it's not an introductory book and it mostly focused on newer JSF features. Developers looking for a book on developing Java-based web applications with JAX-WS (SOAP/WSDL-based web services), Java servlets, or one of the many available non-standard Java/JVM web frameworks; this book does not cover these older and/or non-standard technologies and instead focuses it coverage on JSF 2.2 and JAX-RS. The following are some general observations and opinions of mine formed while reading the PDF version ofDigital Java EE 7 Web Application Development provided to me by Packt Publishing. Code listings tend to build upon same simple example applications that highlight benefits and advantages of the approach being demonstrated. Code listings are black font on white background with no color syntax highlighting and no line numbers even in the electronic (PDF) version of the book that I read. I liked that there are extensive code listings and understand that printed books would not be able to have color syntax highlighting, but having color syntax in the code examples (especially the larger ones) or otherwise emphasized code would have helped with code readability. There are several color screen snapshots in the PDF version of Digital Java EE 7 Web Application Development to help illustrate the web pages rendered by JSF and related web technologies. There are also color graphics for illustrating concepts in the electronic version. Although Digital Java EE 7 Web Application Development is a Java EE book, it does a nice job of inserting some Java SE 7 JDK libraries in the examples. In particular, the Java 8 date/time libraryis used multiple times and Chapter 1 introduces lambda expressions. "these tags render the content from the javax.faces.HtmlMessages and javax.faces.HtmlMessages components respectively"
"JSF 1.0 was created in the early noughties,..."
"...new package structure reserved for MVC under javax.mvc. The @javac.mvc.Controller annotation..."
Each of the chapters has a set of questions and exercises at the end of the chapter. I didn't run through any of these and cannot comment on the benefits of them. I also am not aware of any answers or solutions being provided for any of the exercises or questions. Pilgrim references his other Packt title, Java EE 7 Developer Handbook, several times in this book for readers who need additional background Java EE details, particularly in areas outside of the user interface. Reviews for the earlier book probably provide good indicators of what one can expect from Digital Java EE 7 Web Application Development. Indeed, I noticed that several of the positive and negative comments on Amazon.com apply to the book I'm reviewing as well. As of this writing, there are 10 reviews of Java EE 7 Developer Handbook on Amazon.com with an average 3.8 (out of 5) rating. Find the author's own description of his book in the blog post My Digital Java EE 7 book is now published.